Recent UT Martin graduate from Collinwood and former criminal justice major, Lesley Daniel, dreams of someday working for the Tennessee Bureau of Investigation, and she is thankful for the opportunity her alma mater recently gave her to practice in the field of forensics. Daniel was one of 16 UT Martin students to attend the first ever National Forensic Academy Collegiate Program (NFACP). The three-week program held in the summer of 2012 at the University of Tennessee Law Enforcement Innovation Center in Oak Ridge taught students crime scene management, forensic digital photography, latent fingerprint processing, bloodstain analysis and forensic anthropology. 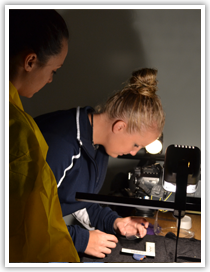 The NFACP mirrors the 10-week in-residence National Forensic Academy that is only offered to law enforcement personnel. “We were the first collegiate class to ever get to go. Everybody else that goes, has to be a police officer or an agent of some type. So this was the first collegiate program,” she said. Daniel knows becoming a crime scene investigator for the TBI will take dedication, and she hopes the experience she gained will help on her way to achieving this goal. Daniel also got to study at the Tennessee Anthropological Research Facility, commonly known as the Body Farm, 1.3 acres of land designated for the study of human decomposition, complete with human remains that have been donated to scientific study. “We got to go there on the last week,” she said. 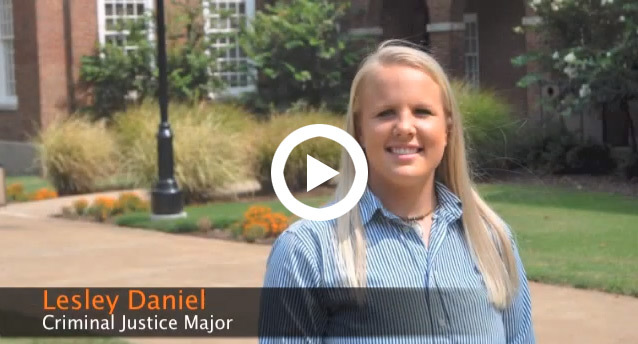 Daniel has enjoyed other rare experiences during her time at UT Martin, as well. She was initially a student at the University of South Carolina Upstate, in Spartanburg, S.C. She transferred to UT Martin two years ago and not only became a part of the Skyhawk women’s basketball team, but shared in the team’s joy as they won the Ohio Valley Conference championship two years in a row and advanced to the NCAA tournament. In 2012 the team got the chance to play against Tennessee legend Pat Summitt when the Skyhawks faced the Lady Volunteers in the first round of the NCAA tournament. Daniel majored in criminal justice at USC Upstate and continued the study after transferring. It’s always been what I want to do. I just think it’s very interesting,” she said.